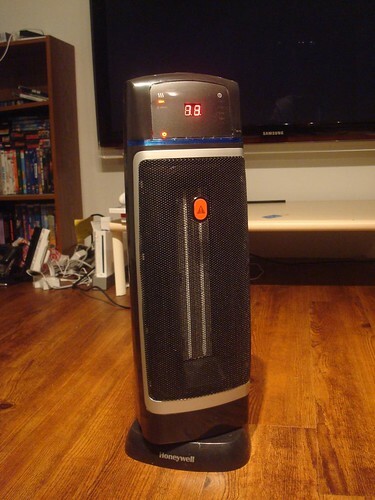 Last weekend we bought a space heater. One downside to a lightly furnished, two story, drafty house is that the downstairs is perpetually cold. As in, last winter when we had our month of nothing over 20 degrees outside, our downstairs was hovering at about 52 degrees. WAY TOO COLD. We would layer on jackets to cook dinner. Ridiculous. Enter the space heater! Everything began well. Nice toasty heat, lovely oscillating motion. For about 3 days we enjoyed our heater, carting it up and downstairs to switch between kitchen, rec room, and bed room as desired. Blissful. It gave me hope that I might not forget that my toes exist this winter. Then came the funny burning smell. Sigh. Back into the box, back to the store, switch for a new one. So, the plan is to take this one back too. Any recommendations? Honeywell (which this one is) was fairly well regarded on Amazon. We like our Presto Heat Dish. It doesn't blow hot air, but it emits a good deal of heat.